A new bill written by the Nevada Collision Industry Association would stress policyholders’ right to choose an auto body shop with a notification requirement similar to other states’. Assembly Bill 402 requires an insurer to remind consumers that they have the right to choose their car rental, auto glass or collision repair services, and never suggest any other location once the policyholder has made their picks. They are allowed to suggest a direct repair program shop if the customer doesn’t know where they want to go. It also specifies that an insurer who said in a policy that a total-loss vehicle would be repaired with a similar one or a comparable amount of money must do so and also pay all the taxes and fees needed to register the new vehicle. The insurer is also now required to pay a claim in 15 days instead of 30 days and to inspect a vehicle for which a claim has been filed within two (for undriveable wrecks) to five days. The penalty for breaking this law is increased fivefold for insurers, from $5,000 to $25,000 — reducing the incentive to violate it and just treat the fine as a cost as doing business — and tenfold for personnel like adjustors and brokers, from $500 to $5,000. Association Southern Nevada chapter Chairman Brian Kelley, who also owns Velocity Collision Center in Las Vegas, said repairers had tried to get a consumer bill of rights in past years but opted for a different approach in 2015. Not only that, Kelley said, the insurer stressed that work couldn’t be guaranteed by the father used his own shop! While most insurers don’t fall into this stereotype and are already up to the standards specified by the law, according to Kelley, codifying these guidelines would weed out the remaining bad apples. Plus, it could clear up customer confusion about what picking their own shop actually means. Kelley said that customers often think that picking their own repairer over an insurer’s recommendation could affect their premiums (it doesn’t). As indicated above, the law doesn’t prevent direct repair program shops from being suggested, and it also doesn’t require original equipment manufacturer parts (unless that’s what the policy says) — not even on newer cars. Kelley said he wasn’t trying to knock preferred shops or recycled or aftermarket parts, which he said all have merit and a place in the industry. “I think there needs to be some discretion” with parts, Kelley said, so long as they’re the “like kind and quality” type specified by the bill. In Kelley’s experience, most insurers have been understanding when a repairer insists that a part, while similar, really isn’t “like kind and quality,” such as a headlight a couple of years old that’s already yellowing. He said that the bill didn’t attempt to require OEM parts on newer vehicles (such as the last three model years), because often the fact that a repair had been necessary at all — and not the parts used in it — was truly what affected a vehicle’s resale value. It doesn’t matter how skilled a repairer was in restoring the car, once a dealership or customer says “show me the CARFAX” and finds a crash report, the trade-in value battle is lost, according to Kelley. “Realistically, it is the part that’s hurting the cost,” he said. The bill’s been sent to the Committee on Commerce and Labor, and Kelley said he was planning to visit Carson City to lobby for the bill this week. He said there had been some momentum behind the bill, and he was “hopeful” it would pass the Assembly committee and chamber as a whole. The battle would be the Senate, he said. 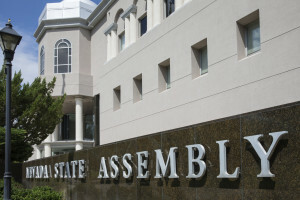 Be heard: Nevada legislator contact information can be found here.